Since I last updated about the our Valentine's Day celebration, we were busy getting our home ready for CNY. Went to IKEA to get a new furniture (else our house will just look the same as last year, and the year before lol), bought all the CNY cookies, drinks and snacks, and massive spring cleaning! I remember there was one year (I think our first year giving angpows) when we took it for granted and only wanted to change our money into new notes a few days before CNY. Too late! In the end we pinjam from Boon's mum. So fail leh :') But not anymore! 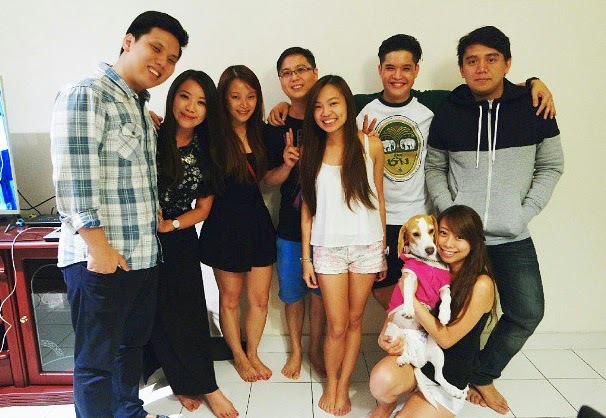 So here's a major update on what went down for Chinese New Year 2015! Most of these had been updated on my Dayre, but I still want to update on the blog cos I know many of you don't use Dayre. Having said that, I used to think that I have too many social media accounts to handle (FB, Insta, Twitter and my blog!) to start using Dayre, but once I started I couldn't stop! It's just different from all the other social media platforms. It's like micro-blogging on-the-go with social media-like features. To fully understand what I mean you gotta start using! And if you wanna know more about the useless details of my daily life, follow me at dayre.me/careen! Dunno why I'm extra cheong-hei on Dayre! So a week before CNY, we went for an early family reunion dinner with the in-laws, cos it was my sis in-law's first CNY married and her in-laws were to spend the CNY in Hokkaido. Went for the yummy Mitasu Japanese Buffet Restaurant and here's the husby feeling excites. The quality of food was surprisingly better than expected! Had too many disappointments with buffet food before so the quality of food and service here were a sweet surprise! Had like, don't know how many servings of these! Dude behind be like, "whutttttt". The maternal gramma (wai-po) was around for CNY this time! Here's us posing with little lambs in Pyramid. Excuse my post-facial face hehe. It was the CNY eve, where it's customary to have reunion meals with our families. Since I was married, I never got to have reunion meals with my own fam cos they used to spend CNY in Malacca. But this time since they were celebrating here, I got to have reunion lunch with them and then dinner with the in-laws! So happy! Sumptuous spread prepared by the mum in-law and aunties! After meal, we went to watch Triumph in the Skies as requested by the younger sis in-law and cousins. We were debating between watching Kingsman or Triumph, and majority went with Triumph so okay we went for it. Verdict? Loyal Triumph in the Skies fans were disappointed. First timers like me were also disappointed. Had a good laugh at certain romantic, cheesy parts though cos just so geli!! So so geli I couldn't stop laughing out loud!!! Slept around 3am plus due to late night movie and ongoing fireworks. For the past two years, the husby gave me my share of angpow before leaving home. This year he didn't so I thought since it's 3rd year of marriage already he didn't wanna be romantic anymore lol. Turns out he gave me after giving his parents and sister! Yay thank you husby time to go shopping! In case you're wondering if he got any from me? After going house-visiting at Boon's aunties', we went for our customary coffee hang out. First year it was Plan B at Paradigm, last year was at Coffee Bean at Tropicana City, and this year we decided to go for Frisky Goat! Goat year ma. Sho cute! My first time there tho been meaning to pay a visit. Afterwhich, we went home nap then it was dinner time! Dinner at Fa Ying, Paradigm. Had Thai food and it was good! He knew I dislike guys buttoning up like that so he purposely did it. Called him lala-chai and he gave me that look. Beautiful lantern displays at Paradigm! Look ma! I got a new red afro! Got a bit like afro la no meh. Look ma! My hands are breathing fire! Some weird pose when I asked him for photo. As always. We went for lunch with my fam, and shopped for Charity's pressies! You can see more of her deco on my Dayre! After that we went to Boon's coussie's place, and it was the 3rd day of CNY! For the 3rd day, we were to make a 1-day trip to Malacca to have CNY meal with my aunties who are still based in Malacca. After that some of my friends were coming over for our open house. The night before we slept a little late so when I woke up, I told myself the first thing was to get the CNY snacks and drinks sorted before we left for Malacca. As usual, the husby woke up earlier than me so I got up, walked into the living room and saw all of these on the table. The husby had nicely prepared and arranged everything! Usually I'm grumpy when I first woke up but I couldn't help a huge grin on my face. Heart was all warm and fuzzy. Had a hi-tea session with the relatives at Equatorial hotel, Malacca. Epic moment when my dad and the aunties started joining all the tables together and form a major line of table of the Tan's. Melody and the coussie taking my cam around to take pics of food and themselves and...us behind. See what I meant? Those of us who were sitting in between had A LOT of trouble moving out to get food lor hahaha!! Loveen disowning his bro in-law. We were all coincidentally in red, so this called for fam pics! Hey this CNY we have so many couple shots. I loike! After enduring a 3-hour jam, we quickly dropped by the mall to grab some booze and dinner, and came home to host these monkeys! Love all of them! A night of chats and games of Wolf. Laughed so much til I had no voice left! Everyone left past 1-2am and they even prayed for me and Boon before leaving. I was beyond touched and blessed. Thanks Ming Yue for the initiative and Ming Han for the prayers. After church we went to Pastor Kevin's house for CNY lunch! Pastor and Esther are great chefs and we finally got to experience it! Not your conventional CNY meal- Beef broth western style, homemade bread, cheese, truffles and wine. Me and Boon's portions. I refilled the broth (and wine) again and again cos we sat there for hours chatting away! Love meaningful hangouts like this. Fam dinner with the in-laws, and Boon's buddies came over for a few rounds of games. Boon went back to work on Monday, and so did I and most of the people we know. CNY somehow felt shorter this year! But that doesn't mean that the celebrations stop there! Above was our CNY reunion meal with our second family, our beloved #D11CG! It was potluck style so each of us were in-charge of bringing different food over. My Elephant yee sang, hokkien mee, yee mee, roasted duck from Taman Megah (mannnn it was juicy! ), nuggets, chicken bits, and salted egg har-gou. Place looks familiar? Hehe theme was Red and Pink! After eating (which we couldn't finish, even the duck!! ), we watched The Grand Budapest Hotel and it was fun! So blown away by the cinematography. Composition, framing and colouring were perfection! And on Saturday, I had the whole house to myself as my lady fwens and I had a steamboat party, so the husby went to have dins with his parents and went hang out with his dudes. Hehe! Everyone obsessed with Botak Leong (Yin Har's dad)'s chilli! Which was, to me, what felt like a premium chicken rice chilli sauce! Niceeeee. CHCKL. It was, as expected, 95% eating and crapping, 5% meeting. Sarah had this genius idea to surround the yee sang with paper plates which we used after! No yee sang was left lying around the table after all the crazy "lou". Genius right!! Again, yee sang from My Elephant Thai Restaurant! My default go-to choice every single CNY, and my 3rd My Elephant yee sang this year! Full of fresh vegs, pomelo, yummy sauce and fresh salmon! We had the youngest committee present too! Beautiful baby Elena. My heart melts each time I see her! On Sunday it was a string of house visits after church! Felicia and James' place (didn't take photos!! ), then Michelle and Adrian's place. A nice time of sitting around (and spilling wine), watching weird China dance and Gordon Ramsay, catchups and Fierce curry house! Got to see Tasya again after 1 year (At Siew Min and Peter's wedding a year ago). Used to hang out a lot while we were studying at Taylor's. Good times. All of us had Mutton Briyani except the husby who went for Chicken instead. Which was nice too except mutton was 10x better! Busy peeling the dough and getting the rice out. Oh what a meal! Fierce Curry House has been my favourite and so far it hasn't really disappoint. So glad everyone liked it! That wraps up our CNY so far! This year was different as we spent most of our time here in KL, my family was here with me and I got to spend more time with them during CNY than before, and we opened up our home for more people to come and dine this year. Boon and I told ourselves when we renovated our house 3 years back, that with such a nicely refurbished place, we ought to share it with people. Else, it'll be pointless to keep it only to ourselves. We're glad that so far we've been able to host different groups of friends, and we love getting our home warmed up, buzzing with conversations and laughters. Though it was a busy CNY, we managed to find time to rest in between and being with all the people we love made our CNY so much more special and meaningful. aww...so sweet can gathered together!